"There are growing concerns in Washington about China's influence in Latin America," Dr Rubrick Biegon, a lecturer in international relations at the School of Politics and International Relations of the University of Kent, told Sputnik. "Even former Secretary of State Rex Tillerson, viewed as a relatively moderate voice within the Trump administration, had evoked the Monroe Doctrine to warn against China's increased presence in the region". The British academic doubts that "Venezuela is being transformed in a US-China battlefield" but does not rule out that "China's relationship with Venezuela may factor into Washington's interventionist posture". However, he highlighted that Venezuela has long been in Washington's cross hairs: "The US has viewed the government of Venezuela as an ideological and geopolitical adversary since Hugo Chavez came to power in the late 1990s". Therefore, the removal of Maduro from office "would accomplish longstanding geopolitical goals that predate the current set of political and economic crises in the country," Dr Biegon opined. "I think the US's approach to Venezuela is being driven more by longstanding ideological and geopolitical motivations than concerns over China's role in Latin America or the US-China trade dispute," he added. Evandro Menezes Carvalho, a professor of international law and the director of China studies at Brazil's Getulio Vargas think-tank, believes that Washington is trying "to get back South and Central America as [its] areas of influence and exclusive political domain", after George W. Bush shifted the US' focus to the Middle East. "The US has realised that China has become the main trading partner of many of [South American] countries and has increased its prestige in the region — which has led some Latin American countries to withdraw recognition of Taiwan as a the government of all China," he said. 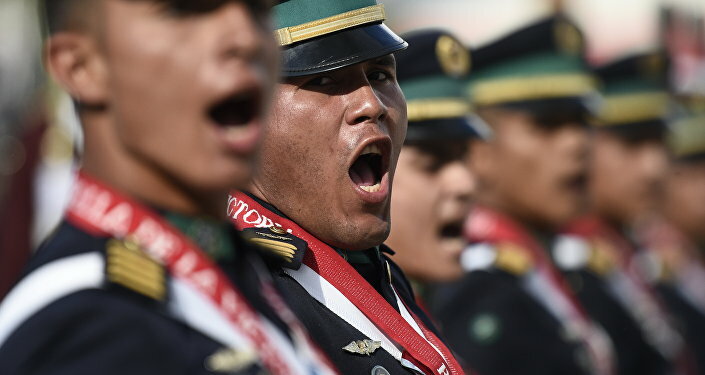 According to the Brazilian scholar, the US is trying to reduce Chinese influence in the region "through instruments that have been used extensively in the Latin American to destabilize and overthrow left-wing governments: law and the media". "The case of Huawei is an example," he suggested. "First, it uses a supposedly unlawful fact to undermine the company's reputation, and then comes the Western media spreading the news to create a fear of a 'Chinese threat'. This is all part of the fight for the influence in the world. And China is the country that today threatens the US podium". While the Trump administration recognised Venezuelan opposition leader Juan Guaido as the country's interim president, China, Russia and Turkey are among those countries which are still supporting Maduro as the legitimate head of the state, as he was democratically elected. As a result, Washington has faced a serious dilemma, the scholar pointed out: Being permanent members of the UN Security Council (UNSC), Russia and China may "veto any decisions to use force against Venezuela" on the part of the Trump administration. 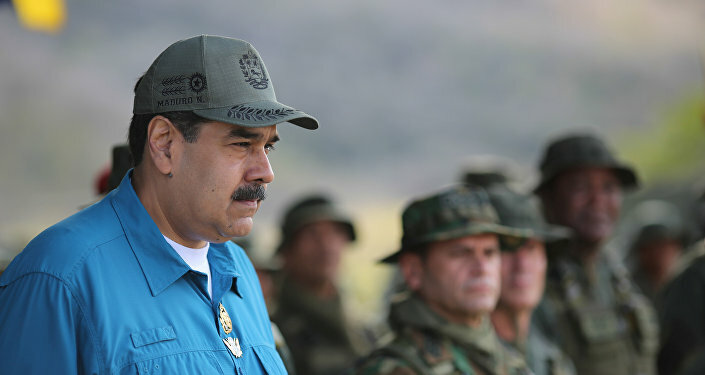 Venezuelan President Nicolas Maduro attends a military exercise in Turiamo, Venezuela February 3, 2019. Beijing has good reason to support Maduro, Carvalho underscored: First, the Chinese leadership understands that Guaido has no legitimacy and "has not demonstrated, so far, the effectiveness of his supposed government"; second, "China has invested many billions of dollars in Venezuela and a change of government and regime could cause a huge loss to Chinese economic interests". According to the Washington DC-based Centre for Strategic and International Studies, the People's Republic of China has invested $62 billion in Venezuela over the past decade. "If the regime changes, China could have greater economic losses and also lose an important ally in South America," the Brazilian scholar presumed adding that "this could have consequences in Asia where China could be tougher against the US presence in the region and make decisions that it has sought to avoid so far — including in relation to Taiwan". "Hard to predict what would happen," Carvalho said. "But there will certainly be a Chinese reaction". Dr Tim Anderson, director of the Centre for Counter Hegemonic Studies in Australia, echoes Carvahlo's concerns: "If Maduro is removed and a US client state is installed, there would certainly be a down-grading of Sino-Venezuelan relations and possibly a direct threat to Chinese investments," he said. According to Anderson, the Latin American state might also be dragged into the Sino-American trade war under Trump if Guaido and his backers prevail. "Venezuela has the greatest oil and gas reserves in the continent, and probably in the world," the Australian scholar noted. "There is definitely rivalry in the US, oil companies that would like preferential access to, for example, investments in the Orinoco belt. To what extent they might be able to block or reverse Chinese investments there would depend on US ambitions and the level of dependence of any newly installed puppet regime". Not only might Sino-Venezuelan relations suffer if Maduro is ousted, but the whole vector of Caracas' foreign policy would be changed, Anderson believes. He elaborated that "the US and its clients will not just have to remove Maduro, they would have to dismantle Bolivarian institutions [not least the army] which have been built up over almost two decades". "With hegemonic control over media, economy and military, the imperial power hopes to dictate the terms of engagement [in Venezuela and in the region] to other powers, such as China, Europe and Russia," the Australian professor noted. Anderson foresees that if Washington takes over Venezuela, it "might expect to consolidate its energy stocks and energy security while maintaining its attempts to blockade Iran and keep Europe and Russia apart". "All this mega-sabotage really begs the question of when China, Russia and Europe (and of course Latin America) will develop financial mechanisms which enable them to escape US economic aggression," he said. "The EU says it is currently developing a 'special purpose vehicle', by which to avoid US 'sanctions' and to do normal business with Iran, as they promised in the JCPOA agreement". However, according to the professor, "it remains to be seen whether the Europeans, right now, have the will to make these breaks with Washington".